Besides me blabbing on about my life, I figure I should also write about different things I have learned over my years of bird keeping. One important thing I was reminded of tonight are stainless steel dishes. I use stainless steel dishes for both my food and water. I clean them with hot soapy water every day to avoid bacteria growth. Some people use plastic dishes, and I highly recommend tossing those out and replacing them. Plastic dishes should be replaced OFTEN if you use them. They are porous, and can get scratched easily and these tiny little scratches can harbour bacteria, no matter how much you scrub! I know a few birds that got constant bacteria infections until their owner replaced their dishes with stainless steel. If you DO use plastic dishes, I would wash them in hot soapy water with a bit of bleach… DAILY. I do use plastic dishes for things such as herb salad, which I think is okay since that food doesn’t get replaced often, nor does it get soiled with wetness – I check it often. 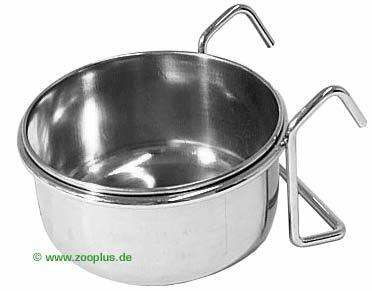 Stainless steel dishes come with two types of holders. Personally, I prefer the clamp, because I can imagine seeing the bracket pulled off of the cage easily due to curious beaks. Anyways, that’s my spiel on stainless steel dishes!